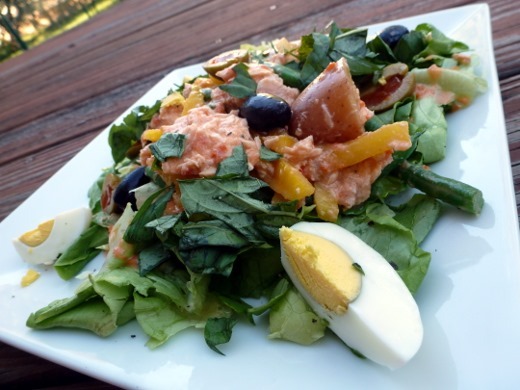 Niçoise Salad is a French salad that is basically a big tasting plate of healthy, delicious goodness, including tuna, tomatoes, olives, potatoes, hard boiled egg, and green beans, dressed in a light vinaigrette dressing. When in Prague last month, one day I ordered a lovely Niçoise Salad for lunch one day, as well. Though we weren’t in France, this was a perfect summer lunch! The best part of that Niçoise Salad was the VIEW! 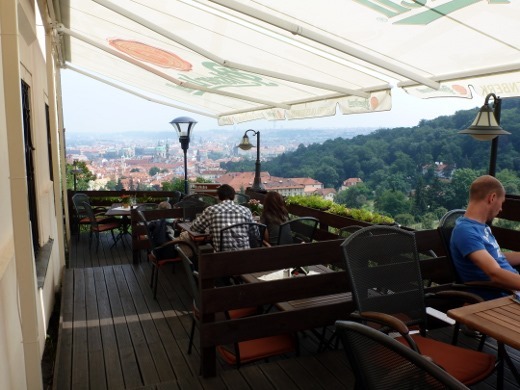 We dined on this amazing terrace overlooking Prague and Petrín Hill. I want to live on this terrace. 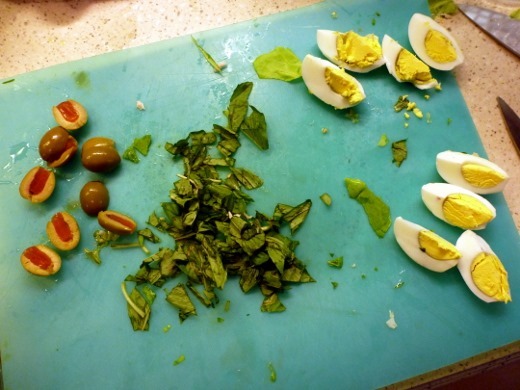 One we were back home, I decided that I must try making my own Niçoise Salad. 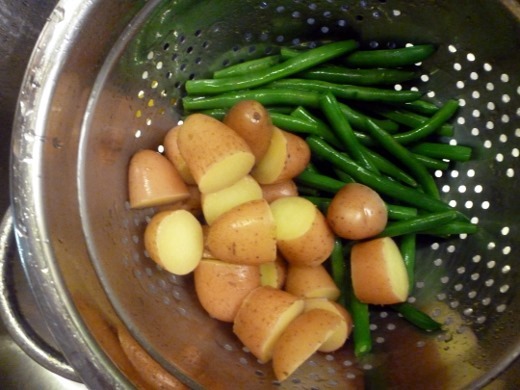 First I boiled veggies: red potatoes and green beans. 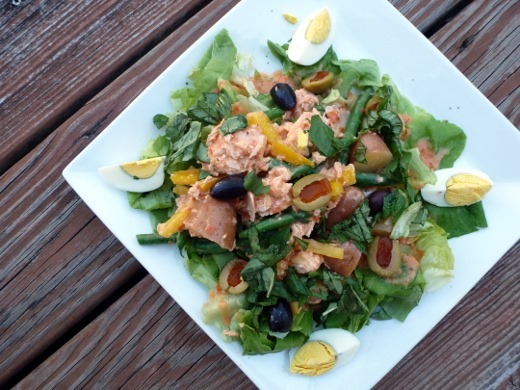 Due to the fact that I was watching my waistline after eating lots of CARBS AND MEAT in Prague the week prior, I tried out a recipe from the Food Network for Light Nicoise Salad, with only a few small tweaks and substitutions. The dressing, which was simply a puree of fresh tomatoes, olive oil, light mayonnaise, and red wine vinegar, was prepared exactly as instructed by the recipe. After a spin around the blender, I was left with this beautiful creamy red tomato dressing for the salad. 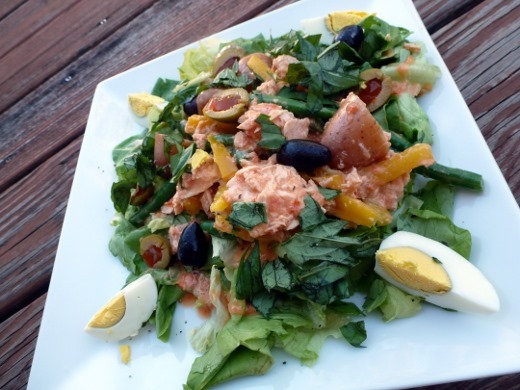 Salty olives, fresh summery basil, and hard-boiled egg added lots of flavor, color, and interest to the salad. To compose the salad, I first prepared a generous pile of Bibb lettuce on each plate, and drizzled with some of the tomato dressing. In a separate bowl, I tossed canned albacore tuna, cooked green beans and potatoes, and sliced bell pepper with the remaining dressing. 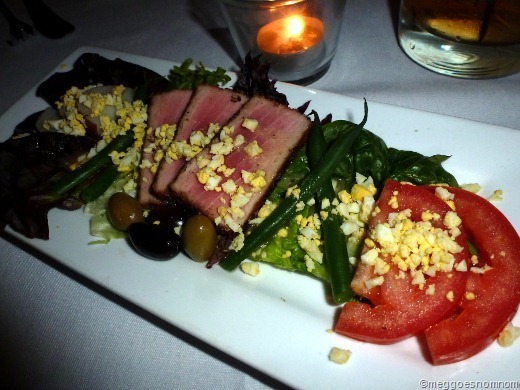 This dressed tuna mixture was then placed atop the greens. 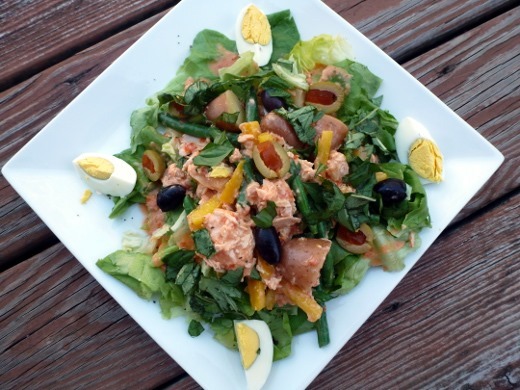 The remaining ingredients – hard boiled eggs, olives, chopped fresh basil – were then arranged atop the salad base, to create this lovely summer dinner. 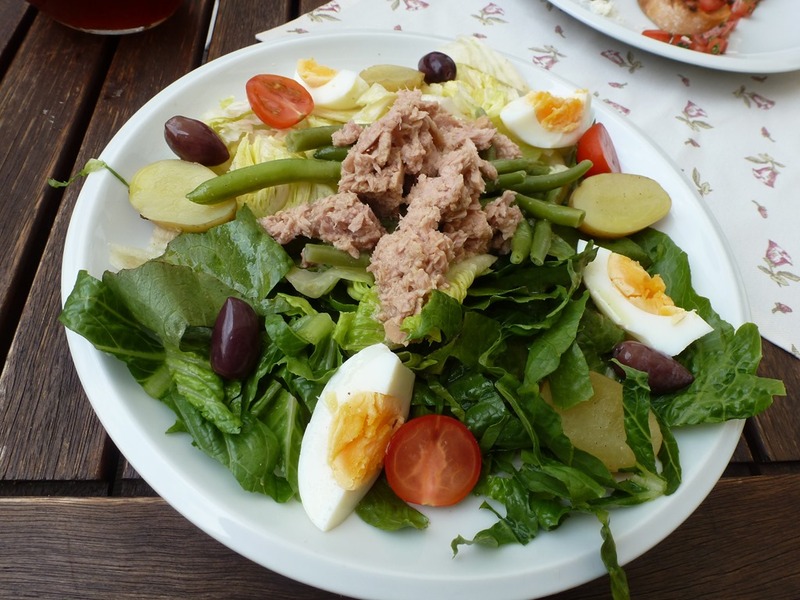 What I love about Niçoise Salad is that it never gets boring, No two bites are the same. With each forkful, I like to compose a different combination of flavors. Egg and olives? Green beans and tuna? Potatoes and basil? Like it said, this salad keeps dinner interesting. If you’re looking for a light, refreshing, and healthy summer meal, I do recommend this recipe. Obviously you can add or omit ingredients to suit your fancy! Put the potatoes in a medium pot and cover with water by about 2 inches. Add a pinch of salt, cover and bring to a simmer over high heat. Reduce the heat to medium high and simmer until just tender, about 5-8 minutes. Add the snap peas and continue simmering, covered, until the peas are crisp-tender, about 3 more minutes. Drain the potatoes and peas and rinse under cold water; transfer to a large bowl. 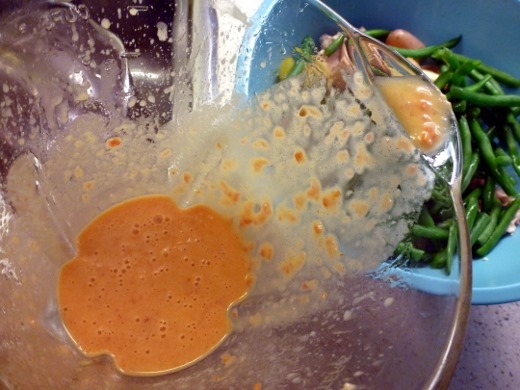 Make the dressing: Puree the tomatoes, olive oil, mayonnaise, vinegar and 1 tablespoon water in a blender. Divide the lettuce among 4 bowls and drizzle with some of the dressing. Add the tuna, bell pepper, olives and basil to the potatoes and peas; add the remaining dressing and toss gently to coat. Season with salt and pepper, then pile on top of the lettuce. Makes four medium salads or two really big ones.